PinBroidery customer Ivy Crowhurst has sent us a picture of her interpretation of the PinBroidery Christmas tree design. 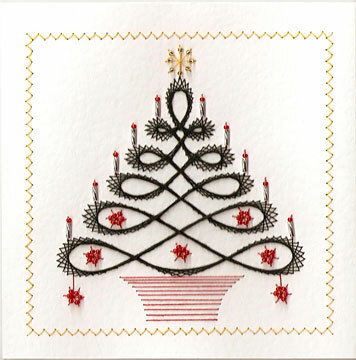 The tree is beautifully stitched in black thread with deep red beads for the decorations and red and silver beads for the candles. It makes a striking card that has a gothic feel to it. This entry was posted in PinBroidery and tagged PinBroidery on Wednesday 9 September 2009 by David Jefferson. I want to say, that I like the christmastree you made. i love this pattern. i have embroidered several trees all in various colours with beads to match the thread used. although the pattern is not one of the easiest ones i believe it is one of the prettiest and once the pattern is mastered you will be hooked. Thank you for your kind comment Zoe, I am please to hear that you like the pattern. As you say, it is not one of the easiest to stitch for the first time. However, once the sequence is understood it becomes straightforward.